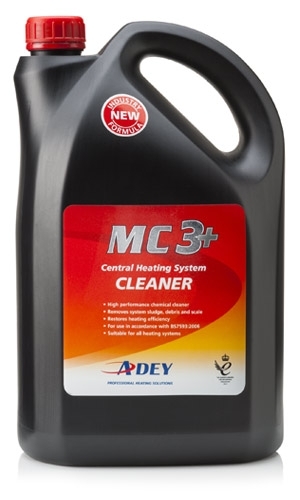 High performance MC3+ from Adey, the makers of the market leading MagnaClean® filter, removes both system corrosion and limescale deposition. MC3+ central heating system cleaner is a new rapid performing and powerful chemical cleaner specially designed to remove central heating system sludge and debris. Formulated to provide better sludge removal for the average-sized system AND cleans systems with up to 15 radiators. Suitable for both sealed and open vented central heating systems. The new, stronger formula has undergone stringent testing in Adey's accredited laboratory. It has been designed to provide better, stronger and improved cleaning. Our recommendation for dosing is one bottle per 125 litre system or up to 15 radiators.